I’ve been interested in intraocular sustained drug delivery systems for years, and I have participated in clinical trials of several delivery systems. This article describes a recently developed technology designed to deliver fluocinolone acetonide to treat patients with uveitis over a sustained period with an approach that is less invasive than currently available surgically implanted systems. • The surgically implanted fluocinolone acetonide intravitreal implant 0.59 mg is effective for treating chronic uveitis. • However, it requires surgical placement and it can cause cataract formation and elevated intraocular pressure. • A less invasive 0.18 mg fluocinolone acetonide intravitreal implant, delivered by injection, is pending FDA approval for treatment of uveitis. Fluocinolone acetonide is an insoluble, lipophilic synthetic corticosteroid. The first surgically implanted fluocinolone acetonide intravitreal implant I evaluated was a prototype that looked like an elongated cylinder. We implanted it into the eye of a patient with severe panuveitis, and we were able to control the inflammation. It was predicted that this delivery system could release the drug for up to 18 years, but it was not deemed to be practical for further development because there would be no way to design a study to assess how well this system worked (everyone involved, including many of the patients and most of the investigators, would be long gone by the time the drug was depleted). I was also involved in the clinical evaluation of a next-generation device, the surgically implanted fluocinolone acetonide intravitreal implant 0.59 mg (Retisert, Bausch + Lomb/Valeant), which was designed to release the drug for roughly 3 years. The US FDA approved the implant based on results from two phase 3 studies.1 The implant is indicated for treatment of patients with chronic uveitis affecting the posterior segment of the eye (ie, intermediate, posterior, and panuveitis). I still find this drug delivery system to be useful, and I use it in patients who are either intolerant of systemic medications or who have unilateral disease, usually with macular edema and no systemic findings. The surgically implanted 0.59 mg fluocinolone acetonide intravitreal implant is effective, but it can cause cataract formation and elevate intraocular pressure (IOP). It is important to note that cataract occurs within 3 years in virtually every phakic patient receiving this implant.1 In fact, whether in a sustained drug delivery system or not, if a steroid is administered frequently enough over a long enough time period, it will cause a cataract. The rise in IOP with this implant, although controllable, often requires a glaucoma procedure, which is another drawback. Additionally, the 0.59 mg fluocinolone acetonide intravitreal implant must be surgically implanted in the OR. What if a less invasive option were available? That was the underlying idea for the development of a three-year injectable fluocinolone acetonide intravitreal implant 0.18 mg by EyePoint Pharmaceuticals using the company’s Durasert Technology. Before a new indication can be added for a drug, clinical testing is required. I performed a pilot investigator-initiated study (IIS) of the injectable 0.18 mg fluocinolone acetonide intravitreal implant in patients with posterior uveitis.5 I was at first provided with injectable fluocinolone acetonide intravitreal implants with two release rates to treat patients with intermediate, posterior, and panuveitis. The study was later modified to include only the 0.2 µg/day implant, the commercially available version. In this pilot trial, the implant was placed in 11 eyes of 11 patients with noninfectious intermediate, posterior, or panuveitis.6 The primary endpoint was change in status of uveitis in the study eye. We looked at the rate of recurrence over time and at the status of the patients’ untreated fellow eyes as a comparison in 10 of the 11 eyes that had inflammation in both eyes. None of the eyes that received the implant had recurrent inflammation over the 2-year time period, whereas the patients’ less severely affected fellow eyes, which did not receive an implant, had significantly more recurrences and ultimately worse visual acuity. Patients enrolled in the controlled phase 3 trials had chronic uveitis with recurrent inflammation for at least 1 year in at least one eye.7,8 During the year before enrollment they had to have either two separate recurrences requiring treatment or to have been treated systemically with immunosuppressants or a steroid for at least 3 months or to have had at least two injections of local therapy. Patients were randomly assigned 2:1 to receive either the injectable 0.19 mg fluocinolone acetonide intravitreal implant or a sham procedure. The treatments were administered in the clinic. The primary endpoint was recurrence of uveitis in the study eye within 6 months. A secondary endpoint was recurrence of uveitis within 3 years. Other outcome measures included recurrence of uveitis in the fellow eye at 1 and 3 years. At 6 months, uveitis had recurred in 28% of treatment eyes, compared with 91% in the sham group. This difference was statistically significant. 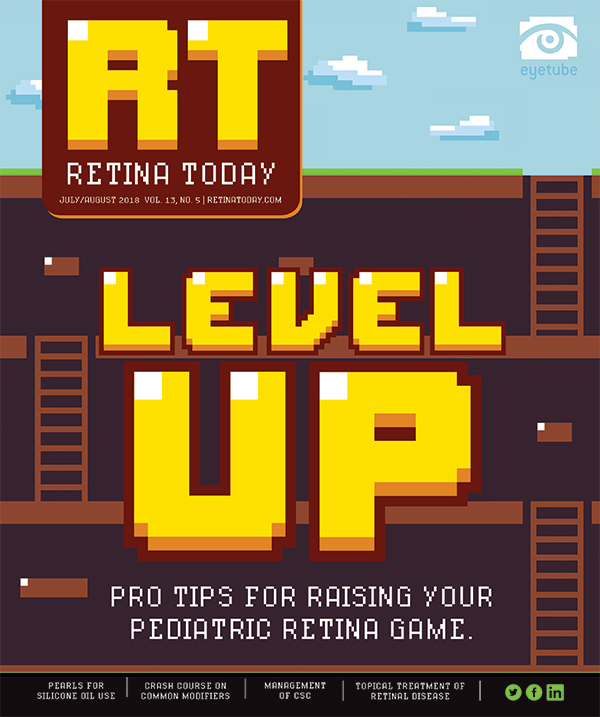 At 1 year the recurrence rate was 98% in sham-treated eyes and 38% in treated eyes. Based on the results of the phase 3 trial, EyePoint submitted a new drug application (NDA) to the FDA in January for its fluocinolone acetonide intravitreal implant 0.18 mg (Durasert Three-year for Posterior Uveitis).4 The NDA includes data from two phase 3 studies that each achieved their primary efficacy endpoint at 6 months. The safety profile of patients treated with the implant was consistent with the safety profile of other steroid treatments that are considered standard of care for this disease (the dexamethasone intravitreal implant 0.7 mg [Ozurdex, Allergan] and the fluocinolone acetonide intravitreal implant 0.59 mg). The FDA has given the company a target date of November for a response to the NDA. Following are some observations based on my experience and the clinical trial record. In the IIS, I did not observe any recurrences of inflammation in patients through 2 years after implantation. We have seen some recurrences between 2 and 3 years, but we’ve also had some patients who have had no recurrences. I believe those latter cases are not so much because we cured the disease but because the patients’ overall disease activity decreased over time. IOP response to the steroid in general was quite low in the phase 3 study. At 12 months, three of 87 eyes in the implanted group (3.4%) ended up needing surgery to address IOP elevation compared with two of 42 patients in the sham-treated group (4.8%). There was minimal difference in the two groups, and my experience has been that patients who develop an IOP response tend to do so early on. If they haven’t developed one by the end of year 1, odds are that they won’t have a problem. Whether patients required additional systemic or local therapy is another important question because it gets at the potential for reduction in treatment burden. In the group that received the implant, 19.5% of patients needed systemic therapy, whereas 41% of patients who received sham injection required such therapy. That is, twice as many patients needed additional systemic therapy if they did not receive the implant. The need for local therapy (intra/periocular steroid injection) was also much greater in the sham group (62%) compared with the treatment group (7%). Figure. 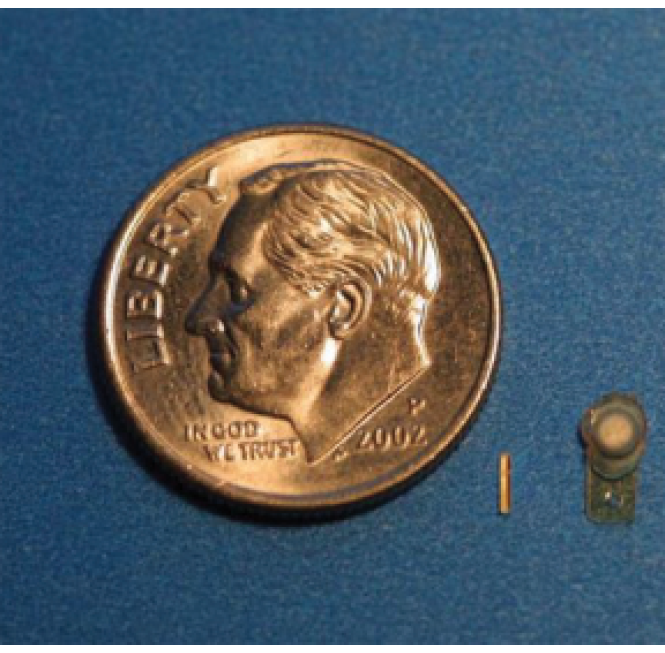 Size comparison of 3-year injectable fluocinolone acetonide intravitreal implant 0.18 mg (left) and surgically implanted fluocinolone acetonide intravitreal implant 0.59 mg (right). Although the surgically implanted 0.59 mg fluocinolone acetonide intravitreal implant and the injectable 0.18 mg fluocinolone acetonide intravitreal implant contain the same drug, use a similar sustained-release technology, and are placed in the same anatomic location (the pars plana), the inserts are quite different. The 0.18 mg implant is a small, cylindrical polyimide tube that is injected through a 25-gauge needle injector and releases the drug from one end. The surgically implanted 0.59 mg implant is laminated with a coating of silicone and polyvinyl alcohol (Figure). The 0.59 mg implant releases the drug through a semipermeable membrane or port. One advantage of the surgically implanted drug delivery device comes into play in vitrectomized eyes because it stays in place and doesn’t move around. Also, in aphakic eyes, the injected implant tends to move out of the field of vision and lodge in the vitreous base, but it could potentially migrate into the front of the eye and cause problems with the cornea. Another injected treatment option for patients with uveitis is the dexamethasone intravitreal implant 0.7 mg. That implant, indicated for treatment of noninfectious posterior uveitis, lasts 6 weeks to 3 months and is often used in instances of severe inflammation. The hope is that the injectable 0.18 mg fluocinolone acetonide intravitreal implant will achieve FDA approval later this year and become a viable option for physicians who want to provide long-term therapy to their patients with uveitis through an office-based procedure. 1. Retisert [package insert]. Waterford, Ireland: Bausch + Lomb. Revised December 2017. 2. Iluvien [package insert]. Alpharetta, GA: Alimera Sciences. Revised November 2016. 3. Alimera Sciences receives acceptance of filing to obtain approval for Iluvien non-infectious posterior uveitis indication in Europe [press release]. Alimera Sciences. January 4, 2018. http://investor.alimerasciences.com/index.php/news-releases/news-release-details/alimera-sciences-receives-acceptance-filing-obtain-approval. Accessed June 26, 2018. 4. EyePoint Pharmaceuticals. Product Pipeline. http://eyepointpharma.com/pipeline/. Accessed June 26, 2018. 5. Pilot study of a fluocinolone acetonide intravitreal insert (FA-i) to treat intermediate-, posterior-, or panuveitis (Iluvien). ClinicalTrials.gov. clinicaltrials.gov/ct2/show/NCT01781936. Accessed June 26, 2018. 6. Jaffe GJ, Lin P, Keenan RT, Ashton P, Skalak C, Stinnett SS. Injectable fluocinolone acetonide long-acting implant for noninfectious intermediate uveitis, posterior uveitis, and panuveitis: two-year results. Ophthalmology. 2016;123(9):1940-1948. 7. Safety and efficacy of an injectable fluocinolone acetonide intravitreal insert. ClinicalTrials.gov. clinicaltrials.gov/ct2/show/NCT01694186. Accessed June 26, 2018. 8. Safety and efficacy study of a fluocinolone acetonide intravitreal (FAI) insert in subjects with chronic non-infectious posterior uveitis. ClinicalTrials.gov. clinicaltrials.gov/ct2/show/NCT02746991. Accessed June 26, 2018.